View menu is used to position the window, view the calculation summary and different way to view models. Tile Vertical arrange the views of model layers next to each other. Tile Horizontal arranges the views of model layers below each other. Calculator … opens a window that displays data about the underlying system of equations (number of flows and equations, etc.) and fault diagnosis with proposals for action. 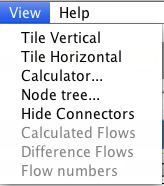 Node tree … show all nodes and flows as a tree structure. Other menu items are not finished yet.